French coffee may be different from what you're used to—quite different. Here's how and where to buy it, and how to get what you want. 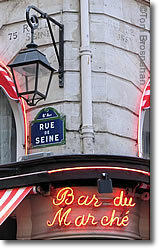 If you sit down in a Paris café and order un café, s'il vous plaît (a cup of coffee, please), the waiter will bring you a café noir (or café express), a small espresso-sized cup containing a few spoonfuls of dark, fragrant, medium-dark roast (not black/burnt) strong espresso coffee. On the saucer will be a few cubes or tubes of sugar, and perhaps a tiny treat: square of chocolate, chocolate-covered almond, etc. If you like strong espresso with a few drops of milk, ask for a café noisette (nwa-ZET). For an extra bold jolt, order a double express (DOOB-luh eks-PRESS), or even a café serré, an espresso made with only half the normal amount of water, and therefore doubly concentrated. If you want less concentrated American-style coffee, and more of it, find a café that offers café filtre (filter coffee) (not all cafés do). It will probably be dark roast, from Arabica beans, closer to Starbucks flavor than the normal cup of medium-brown-roast American coffee. You may also get away with asking for a café allongé (ah-lohn-ZHAY, "extended" coffee) or even an Americano, a shot of espresso in a larger cup, accompanied by a small pitcher of hot water with which to dilute the coffee to the desired strength. 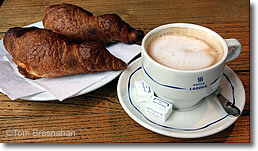 At breakfast, many Parisians prefer café au lait (also called café crème): strong espresso coffee with hot milk. 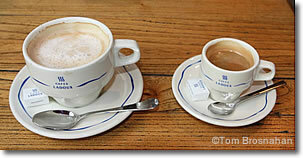 Traditionally, at home, café au lait is served in a bowl, but in a café or restaurant it will come to you in a large cup. From mid-morning through the afternoon you might prefer a cappuccino, espresso coffee and steam-foamed milk with a sprinkle of cinnamon, or powdered or shaved chocolate, atop the foam. On a hot summer day you may prefer café glacé, iced coffee. You can order any sort of coffee déca (DEH-kah) or décafféiné (also glibly called faux—fake): decaffeinated. Traditional French restaurant etiquette dictates that you can drink a café noir any time of day or night, but the only time you can drink coffee with food is at breakfast. It may make sense to you to sip coffee with your rich dessert/pudding/sweet after dinner, but it does not make sense to the French, so you will not be served your coffee until after you have finished your dessert (except for café gourmand—see below). Café Gourmand, an ever-more-popular French coffee-and-dessert combination, is a small cup of medium-roast espresso coffee on a plate with several small sweet treats such as mousse au chocolat, cheesecake, crème brulée, ice cream or sorbet, or macarons. The coffee is served plain black, with sugar on the side if you want it, but no milk or cream. 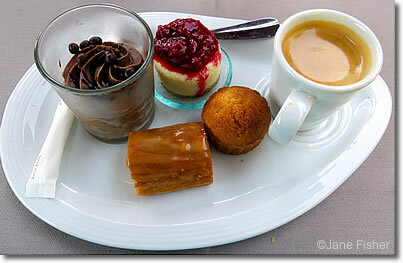 The café gourmand trend goes against the French dining tradition of drinking coffee only after one has finished the sweet course. We like it because the fragrant bitterness of the coffee contrasts nicely with the sweet taste of the desserts. raspberry cheesecake, caramel éclair and lemon gateau. Here's all about Turkish coffee. (or Café Express) on the right.